Stephen Moran has been working cold cases since his appearance in Faithful Place. Holly Mackey, who has aged seven years since Faithful Place, comes to him with a postcard from a wall at her private girls’ school. The wall is known as “The Secret Place,” an anonymous place for girls to put up their secrets. This secret, however, is police-worthy. It references Chris Harper, a boy from the neighboring private boys’ school, who died the previous year, and asserts that the writer knows who killed him. Armed with this new lead, Moran works with murder squad detective Antoinette Conway, both to find a killer, and to possibly break his way into the murder squad itself. The Secret Place is unlike other books in this series so far. It splits the narrative into two competing stories. There is Moran’s story, narrated in the audio version by Stephen Hogan, that goes through the detectives’ moves throughout the day that Holly brings in the postcard. The second story, narrated by Laura Hutchinson, starts nearly a year before Chris Harper’s death, following the movement of Holly and her three best friends up through and past the murder. The detectives figure out the tapestry that led up to the murder at the same time the reader experiences it through the eyes of four teenage girls. 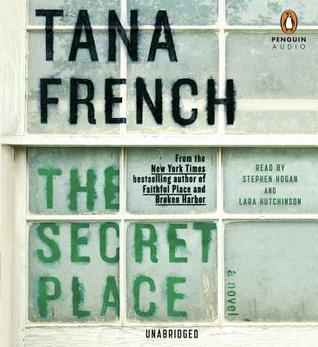 It was an interesting experience, and I think Tana French pulled it off well. The Secret Place is the fifth book in the Dublin Murder Squad series, and it falls right in the middle for me in terms of enjoyment. I liked it more than the first two books (In the Woods and The Likeness), with which I had some issues, but not nearly as much as Faithful Place or Broken Harbor, books three and four. I certainly found myself listening to the audiobook almost obsessively – enough that Stephen Hogan’s Detective-Moran-voice entered my dreams and narrated them for me one night, ha! – but I didn’t feel the same pull as I had with the last two books. I’m not sure why there was that disconnect, but I just didn’t feel quite as compelled as with the last two books. The Secret Place felt slower. Slower could have been beautiful – I like slow – except that it was coupled with one thing that I had conflicted feelings about. This goes into very minor spoiler territory, not related to the case in any way. Feel free to skip this next paragraph if you’d like. The Dublin Murder Squad books, thus far, have been realistic books, in terms of genre. There haven’t been any, say, paranormal elements that have come into them. All of a sudden, though, this book strayed into psychic-like territory. The girls are suddenly making lights turn on and off by opening and closing their fists, making objects burn just with their anger, making things move without touching them. I kept waiting for there to be an explanation, but it never came. The closest it got was Holly mentally commenting, long after the girls stopped doing these things, that she could already tell that as an adult, she wouldn’t believe they’d really happened. And in a way, that makes sense. I remember back to high school, and the psychic-like things that I saw, things that make no logical sense in the world. If they have explanations, I have never figured them out. In that light, I actually really like this part of The Secret Place. At the same time, my adult sensibilities sort of rebel against them, and I find myself wanting that logical explanation, especially in a series that has stayed relentlessly realistic before. End minor spoiler. Beyond the conflicted feelings, I enjoyed the book, just not as much as the last two. I will definitely keep listening to Tana French’s books as they appear, and I can’t wait to find out who the narrator will be for the next volume (I hope it’s Conway!). Performance: Stephen Hogan’s performance was pretty convincing, obviously, if he was narrating my dreams one night. I found it much improved from his reading of Broken Harbor, and didn’t have trouble keeping his character-voices straight this time. Laura Hutchinson’s performance was fantastic, and I admit, her Irish accent was so thick I had a hard time adjusting to it, and had to listen to those sections a little slower (single speed instead of double speed). Both narrators managed to make the teenagers sound mostly like teenagers without sounding silly (as many narrators of teens do). It was a very solid audiobook overall. This entry was posted in 2014, Adult, Prose and tagged audio, dream-invader, RIP-worthy, speculative, WTF moments. Bookmark the permalink. I still haven’t read a single book by French. I have been considering this one – I have been undecided. Have you liked others of hers in the past? I know you wrote this review a while back, but I just finished reading this book so wanted to throw in my two cents! I agree that the weird supernatural twist was really off-putting and I kept waiting for a logical explanation to be revealed that would explain it all. I agree that Holly’s throw away thought that they’d think it was all make believe when they were older kind of made up for it, but also didn’t. I disliked that aspect of the book, and I also didn’t jive so well with the alternating narrations. I felt that because we spent 50% less time with the lead detectives, I felt less invested in Stephen and didn’t feel like his back story connected as much with the main case. The glimpses of Conway that we got were more intriguing to me than what we learned about Stephen. The only place I disagree with you is that I still think Faithful Place is my least favorite French novel. I felt it was the most predictable of her novels and I was able to guess the murderer well before the reveal. I disliked this novel for much the same reasons: I felt the red herrings were fairly obvious and it was clear fairly early on which group the murderer would come from, and then also who it would wind up being. Somewhat ironic that Frank & Holly Mackey appear in my two least favorite French novels! I really loved Broken Harbour, however, so I was really looking forward to this one, and I think that’s why I felt disappointed as well—it just didn’t seem nearly as creepy or twisty in the way that one did. But like you, I love French and will surely keep reading whatever she keeps writing. Apparently Conway’s story will be the focus of the next novel, so that seems promising! Oh! Do we know for sure that Conway leads the next book? At the time of writing this, there was no info out about the next book yet. I’ll have to go check that out. It’s funny – I don’t know if you linked back to my review of Faithful Place, but one of the reasons I liked the book was BECAUSE the murderer was easy to spot from the beginning. It felt less like a mystery and more like an exploration of family and right/wrong. It felt more literary than the first two and was exactly what I was looking for. I do agree with you that it was obvious from the beginning. I didn’t spot the murderer in this one, though. I had guesses, but was just happy to go along for the ride, except for the weird supernatural stuff, heh.